A horse has a God given right to self-preservation. There are different reasons for a horse biting. So often horse biting is a habit that is taught or enabled by us on so many levels. Horses need to be taught the respect that should be in a human relationship. When you observe a mare with her foal, she teaches him about biting in no uncertain terms. 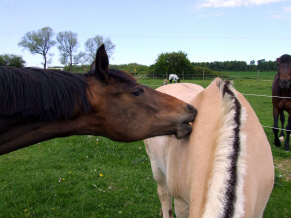 The best way that I have found to stop a horse from biting is to not ever let it start. If it has become a problem one of the easiest ways to make it go away is to simply ignore it. This works especially well with studs. By blocking it or slapping at them, you become a participant in the game. My advice with a stud is to distract him. Give him something else to do. This ensures with a stud or any other horse that the behavior doesn’t get set in and become a problem. To speak of punishment (i.e. smacking him one) doesn’t fit when it comes to horses. Punishment by definition is something that comes after the act. There is no understanding of this by the horse. I have seen people get bit by a horse, and after they quit the hollering and rubbing, they want to whip the horse, and the horse can only stand there and resent it. When the horse comes to bite you, block it right then, not murder the horse after the fact. For questions or comments about horse biting please contact us.